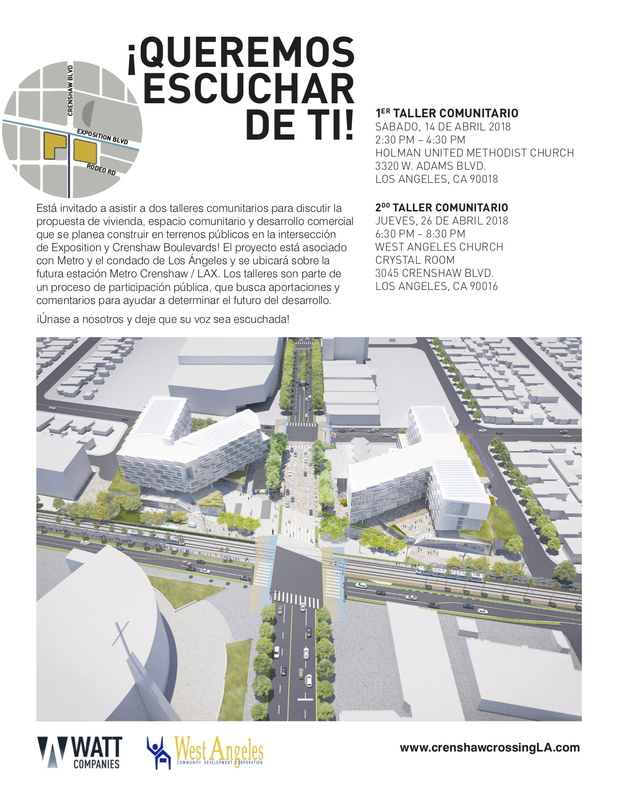 We posted in November about a proposed joint development adjacent to the Expo Line and future Crenshaw/LAX Line at the intersection of Exposition and Crenshaw boulevards. Metro and Los Angeles County are in a six-month negotiating period with Watt Companies to develop the site. There are two upcoming community workshops in April to gather public input and feedback on the project. See the above fliers for dates and times. The proposal is to build 492 residential units, including affordable housing, and about 48,000 square feet of community-serving and retail space on two parcels. The development is literally steps away from stations for the Expo Line and the future Crenshaw/LAX Line, which is scheduled to open in fall 2019. •In addition to the Crenshaw/LAX Line, joint development of Metro and County-owned properties provides a golden opportunity to further invest in the Crenshaw community and meet the needs of its residents. Metro’s goal is to create a project that is inclusive and sensitive to the existing community while serving the needs of future residents and visitors. •Watt has expanded its team to include the West Angeles Community Development Corporation (WACDC), who will play a critical role in the development and operation of the project. WACDC will provide community engagement support and market/lease-up and resident services to support the project’s affordable housing units. •Community engagement is required at all phases of Metro’s Joint Development process. 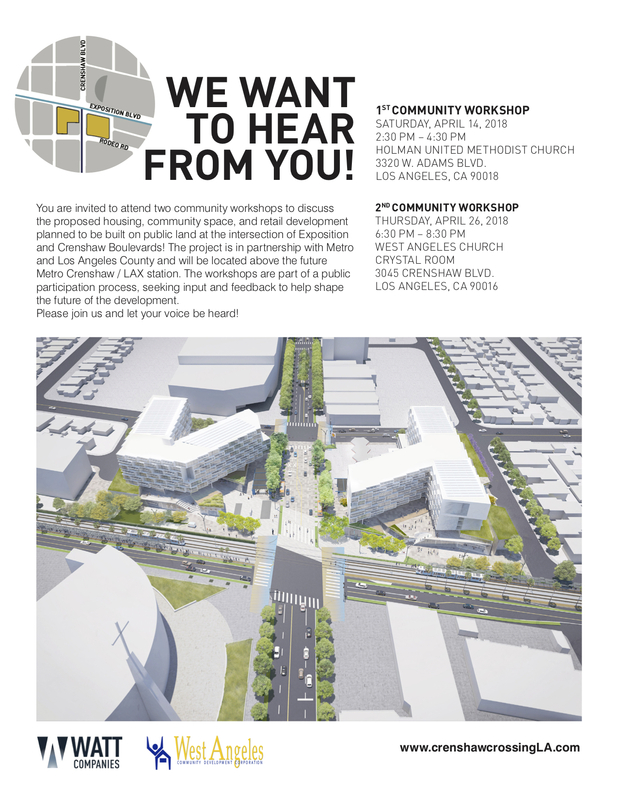 From 2015 to 2016, Metro held dozens of community meetings with Crenshaw Corridor residents, business owners, advocates and others to discuss the community’s priorities for the sites. This input helped shape the project’s Development Guidelines, which set the community vision and goals for future development of the site. Please kill that stupid gas station. It’s an insult to TOD. Convention Center……… for trade show?